Really fortunate to spend time as part of group discussion at University of Queensland with James Vaughan where we drew upon his experiences in football atmospheres within Stockholm, Sweden and Barcelona, Spain while completing his PhD in Creativity & Motivation in football and looking at how cultural aspects & influences affect the ability to create a culture or climate of creativity. James Vaughan is the Lead Researcher at Player Development Project and has played Futsal for New Zealand before carrying out his Masters with the Football Federation Victoria in Melbourne. It all starts with the youth. It has to be fun for them or it makes no sense. Young players are eager to learn and they will dream of playing on the first team, so motivation is already in place. If you have proper training and coaching in place, then these youngsters will learn to dominate the ball and also learn about position play. Maybe the most important thing is what you see in somebody. You need to pay attention to where he comes from; you need to see his character. You also need to see his habits – how does he behave and what can he handle? Interestingly, Cruyff looks at and addresses some of the points observed by James throughout his time at Barcelona; form of life or cultural influences and the importance of this within coaching context and the importance of creative, playful atmospheres for youth engagement and development. One of the points discussed was looking at the fine balance between form of life or cultural environment versus constraint led practices implemented by coaches. Especially at FC Barcelona, he observed and discussed the use of skilful manipulation of sociocultural constraints, where the form of life or environmental conditions surrounding the club could both constrain or afford creative moments, akin to Rietveld & Kiversten’s research (2014). I believe this again shows the socially dynamic role of the coaches; both acknowledging the pull of form of life surrounding strong club and locality cultures while adopting game based or constraint led learning approach to set goals and reward actions for the behaviour you want to see from your players. However, as discussed, it is perceived as important that the coaches are mindful and present for their adopted coaching methodologies and adopt the form of life offered from the coaching scenarios offered as opposed ignoring the sociocultural embeddedness and forcing your ideologies on the group, akin to Cruyff’s ideals of needing to pay attention to where players come from. We discussed examples of soccer coaches entering Australian shores and adopting old ideas and methods versus Guus Hiddink’s embracing of AUS cultures. In basic words, coach where your feet are and be present with you athletes. 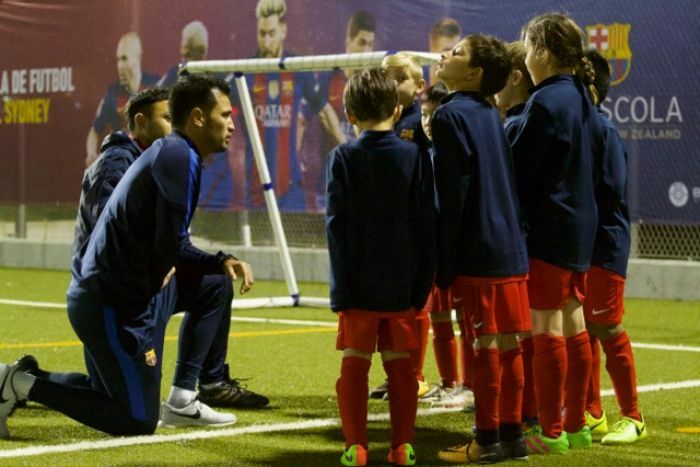 Looking at the importance of creative, playful atmospheres for youth engagement and development, we talked further around the adopted practices of FC Barcelona’s youth sides. James showed and supported the focus on “how to play” and performance outcomes were presented in game based activities or other forms of non-linear pedagogy. It was discussed amongst the group that skill adaptability and attunement IS creativity in action; the focus was more around allowing the form of life or cultural influences to be an expression of how the teams played and developed. Therefore, trying to balance external influences from coaches towards player development and answering individual’s basic needs theory to answer their intrinsic motivation and strivings. Previous research shows intrinsic motivation leads to greater persistence, improved performance and enhanced well-being in a physical setting. While intrinsic motivation stems from innate physiological need of competency and represents the prototype of self-determined behaviour, self-determined extrinsic motivators, which are extrinsic motivators which have been internally rationalised with oneself, become activities which are carried out as important and concordant to one’s values (Mageau, 2003). It has been researched that changes to people’s perceptions of competence and self-determination (relatedness and autonomy) should increase intrinsic motivations and player identification, an important area identified by FC Barcelona as part of the Catalan community. Self-determined forms of motivation also result in optimal behaviour, resulting in peak performance and persistence (Deci and Ryan, 2008), applicable to these age grade programs as these qualities should result in improved player well-being and how players collectively engage and behave within the sport. Many of these mentioned coaching methods and Cruyff’s strategies stemmed around autonomy supportive practices. As mentioned, while there is a focus on environment and development strategies, there is also a shift in player interaction through looking at autonomy supportive practices to help build on Cruyff’s focus areas of building on player behaviour, preparation and mindset as part of development process. As I have mentioned before, I believe coaches should assist players to identify problems as opposed to solving them, offering ideas and assistance for how to think and act as opposed to offering solutions. As Getzels and Csikszentmihalyi’s research addressed, creative people are driven by discovery and creation of problems as opposed to superior skills or ability. Therefore, coaches could adopt ideas from Vygotsky’s Zone of Proximal Development (ZPD), where this theory has the coach standing as a recognised more capable other to the athlete with their requirement being to engage in contextual collaborative and learning relationship with athletes to ensure optimal psychological functioning for maximal sporting performance. This is similar to the ideas mentioned previously of “observe first; then choose to step back or step in”. Zone of proximal development (ZPD) as defined by Vygotsky, is an area I believe would be successfully applicable to specialising athletes in team sports such as soccer or rugby union. This theory encourages players to ask questions and adopt sub routines; therefore, the players are taking over the structure of tasks and practice while acquiring performance or transfer of performance. This again allows coaches to act as mentors, supporting players to develop meta cognitive skills where the athletes are aware of and take responsibility of appropriate practices and thinking strategies. This supports the ideas of learning being a series of episodes; scaffolding, where players identify and build knowledge. Another stage is considering or thinking about adopted knowledge, where players can work independently to analyse developed ideas and skills with last stage being evaluating learning. Through this adopted approach, they could identify applicable monitoring, review and learning processes such as self or peer review or socio-constructionist theory, where learning occurs in social groups through ongoing interactions between relevant people. This method positions coaches as mentors where they shift from knowledge expert for athlete as in early stages of development to learning manager or facilitator (Carnell and Lodge, 2002), offering constructive feedback for the player to investigate further. When it comes to age grade coaching, it’s worth reminding ourselves that creativity resides in the playful state. This environment created by FC Barcelona and the players within display a sense of self transcendence, conducive to embracing creative moments as they were playing in a way they see themselves reflected. We as coaches need to ascertain how we can develop greater opportunities to find these moments within our sports. Thanks to James for reminding us that this happens in the HP atmospheres.